Church's Chicken franchise business opportunity. Free Church's Fried Chicken franchise information. The company operates and franchises more than 1500 restaurants throughout the world. The first "Church's Fried Chicken to Go" was located in downtown <?xml:namespace prefix = st1 ns = "urn:schemas-microsoft-com:office:smarttags" />San Antonio, across the street from the Alamo. The restaurant sold only fried chicken. Church added French fries and jalapeños to the menu in 1955. George Church's idea paid off, and at the time of his death in 1956, four Church's were open. Other members of the family became active in the business, and by 1962 the chain had grown to eight locations in San Antonio. 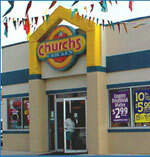 By 1989, Church's was the second-largest chicken franchise organization in the United States. That was the year it merged with the number three chicken chain, Popeyes Famous Chicken & Biscuits, headquartered in New Orleans. The Church's concept remained distinct and separate from Popeyes. Today Church's continues to improve and expand through aggressive re-imaging programs and by seeking alternative development opportunities, including co-branding, convenience stores, grocery stores and travel centers. The company's small footprint and simple operating system are ideal for host venues. Church's Fried Chicken is known for its Southern-style chicken, Church's also serves Southern specialties including fried okra, coleslaw, mashed potatoes, corn on the cob and its unique honey butter biscuits. Future Church’s franchisees will recognize this rich heritage and pride themselves on maintaining this tradition over time. To learn more about the Church's Fried Chicken food franchise opportunity, simply complete the form below.